Bacon Tomato Dip. It is so yum. 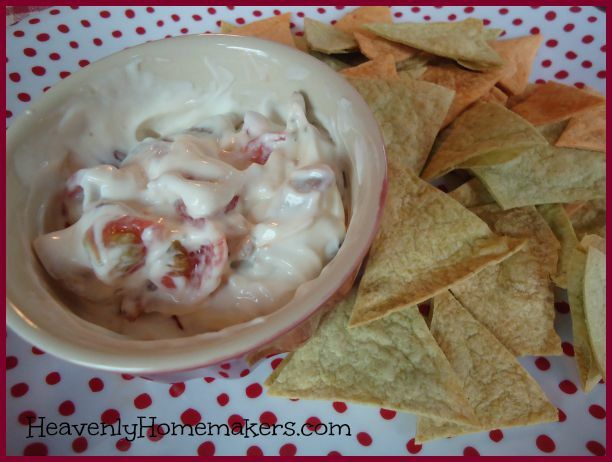 When I first came upon a recipe like this one, it was called BLT Dip. This sounds delicious, but with one problem. The recipe included no L. There was only B and T.
So I played with the recipe and landed on a perfect BT Dip, but decided that BT Dip was a ridiculous name. Come everyone! Try this BT Dip! You will love it! “What a weirdo,” the people will say, “She forgets her vowels.” Then people will try to figure out which vowels and then if they didn’t want to already, they will really not want to try the dip. Bat Dip, Bit Dip, But Dip (have mercy), Bot Dip… The people would be so busy trying to figure out what the name of the dip is really supposed to be that they would never actually look at the recipe and try the dip. This would be tragic (because this dip is terribly delicious). I hope this gives you just a glimpse into how hard my life is. This situation has been crippling. Landing on a title kept me up night after painfully long night – so much so that I again considered adding soggy L to the dip just so I could move on with my life and effectively parent my children. Then I just decided to turn the B and the T back into words. B=Bacon. T=Tomato. Bacon Tomato Dip. How clever. There is nothing more to say except that you really must make this dip. And also the chips as detailed below because those make the dip many percentages better. Cut bacon into bit-sized pieces, cook, and drain. Stir cooked bacon into mayo and sour cream. Stir in chopped tomatoes just before serving. 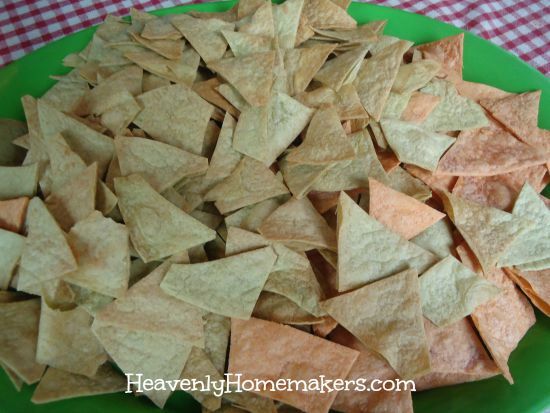 Serve with corn chips or homemade tortilla chips (details below). 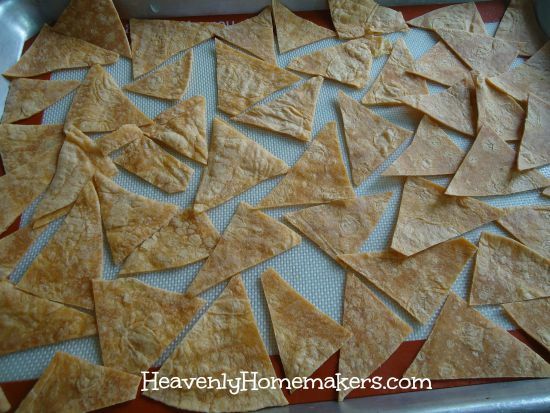 Now let’s talk about making Baked Tortilla Chips. I did not even consider calling these BT Chips because I’d already been through so much trauma. But as you can see, B and T would have also worked for these chips. (B=Baked. T=Tortilla) Try to keep up. 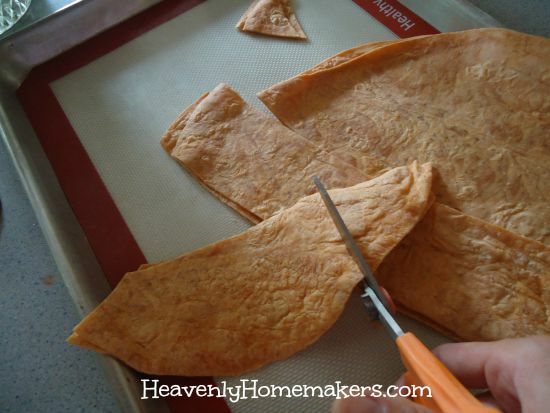 Lay the cut tortillas in a single layer on a baking sheet. 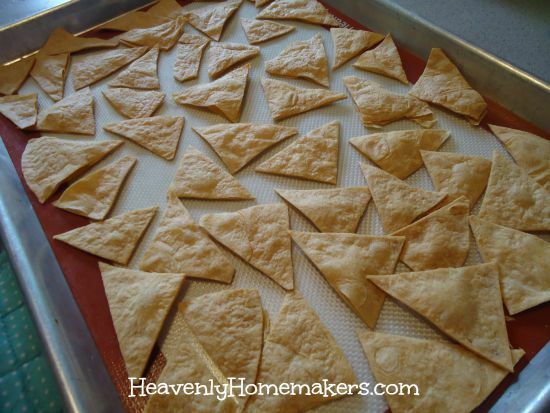 Place them in a 350° oven for about 10-15 minutes or until the tortillas have become crispy. Notice that they puff up a bit as they get crispy. Delicious perfection. Throw them all on a platter and serve them with Bacon Tomato Dip. You will love how delicious this combination is. 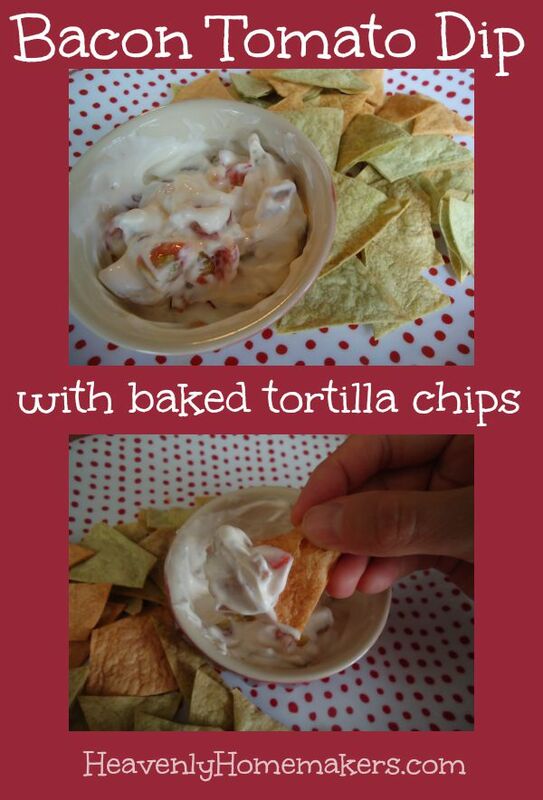 I can’t wait to hear how much you love this dip with your homemade chips! Aren’t you proud of me for actually coming up with a dip that did not involve ground beef or cheese? And also for coming up with such a brilliant name for this new dip? May we all stand (neh, just sit) in amazement. Thanks for the yummy recipe Laura . . . and for the good laugh to start my day! One bit about the chips: before baking you can lightly spritz them with olive oil and sprinkle on cumin or cayenne to make them flavored chips. They might be best with salsa or guacamole. I was wondering what the best way for storing leftover chips was and how long they kept. I really like to make things in bulk to save time and money…so if I made a boatload of chips is it just a matter of storing in a airtight container? Refrigerated? Thanks! I use my pizza cutter, and cut several at one time. Extras I store in a ziplock freezer bag. does this work with both wheat and corn?